Esco Ventures, the corporate venture arm of Esco Group, proudly announces the establishment of Esco Ventures Labs, a biomedical incubation space with wet labs, at Ayer Rajah Crescent, Singapore's start -up cluster. The purpose of Esco Ventures Labs is to create an environment and stepping stone for early-stage start -up companies in the Singaporean life science industry. 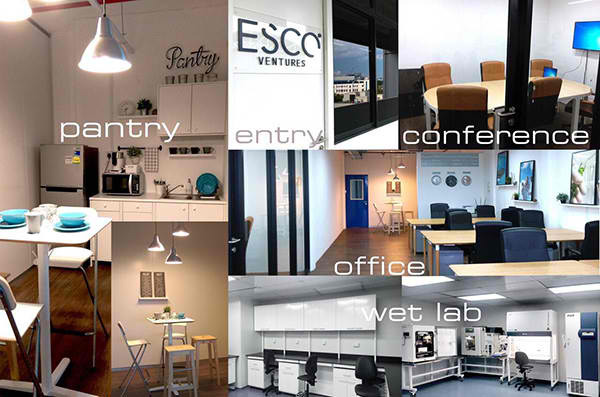 Esco Ventures Labs will provide more than just a physical working space for start-up companies. It will allow access to product development, manufacturing expertise and global distribution network through its parent Group - with a very st rong network of business partners in over 100 countries. Esco Ventures mentors have actual industrial and hands-on operating experience in life sciences and medical devices, plus access to the resources of the Group, which will help local scientists and researchers commercialize their ideas to the global market. Esco Ventures will support the development of each business from creative ideas, to innovation and commercialization, and, ultimately, to market success. Esco Ventures Labs will have fully equipped wet-lab space, and provide comprehensive incubation services to incubatee companies. The first incubatee company is Carmentix Pte. Ltd, a startup company developing novel diagnostic tests to address unmet needs in reproductive medicine.